Hazards Toll finds the declining Salton Sea will impose massive public health and environmental costs on local residents and Californians. The report argues that the continued failure to protect and preserve the Salton Sea, worsening air quality and the loss of valuable ecological habitat – combined with diminished recreational revenue and property devaluation – could cost as much as $70 billion over the next 30 years. Read the report. The Salton Sea is shrinking, and without a restoration project it will transform from California’s largest lake into an economic, health, and environmental hazard. The Sea’s 75-year crash-course is detailed in a report by the Oakland-based Pacific Institute, an independent, nonpartisan think-tank. 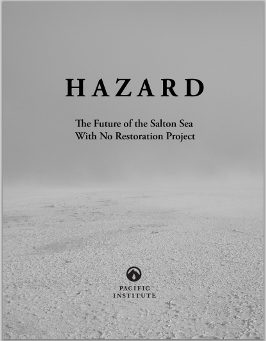 “Failing to act on behalf of the Salton Sea will have dire consequences,” said Michael J. Cohen, lead author of Hazard: The Future of the Salton Sea with No Restoration Project. “California must implement a restoration plan to combat the future problems of a shrinking Sea. Failure to do so will mean nothing less than disaster for the health of the region’s inhabitants, wildlife, and growing economy,” Cohen said. In 60 years, the Sea will be little more than a shallow algal/bacterial soup. In September 2006, California is expected to release its report on Salton Sea restoration options and alternatives. The State is required to submit a preferred alternative to the California Legislature by December 31, 2006. “California has a clear choice: do nothing for the Sea now and suffer the consequences, or fund a restoration project that protects the ecosystem and promotes economic development,” said Cohen. The Pacific Institute is dedicated to protecting the natural world, encouraging sustainable development, and improving global security. Founded in 1987 and based in downtown Oakland, the Institute provides independent research and policy analysis on issues at the intersection of development, environment, and security. Download the four-page executive summary.